Starring: Tom Hiddleston, Samuel L. Jackson, Brie Larson, John C. Reilly, John Goodman, Corey Hawkins, John Ortiz, Toby Kebbell, Jason Mitchell, and more. “Yeah, I’m thinking I’m back.” Wait… a couple reviews late? Sorry. STILL! Relevant to this review, the king is back and that king is King Kong in his brand new film ‘Kong: Skull Island’. It is time for the Monsterverse to officially begin following the 2014 ‘Godzilla’ film. 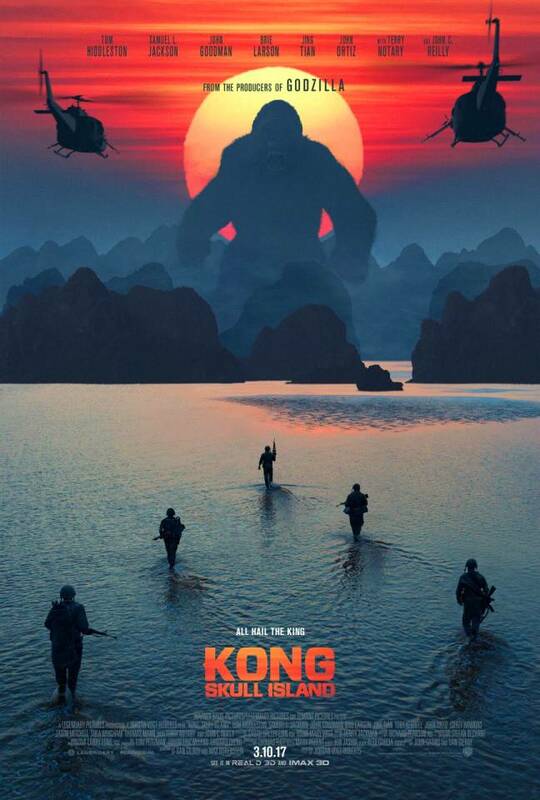 Early speculation (including myself) have dubbed the new Kong movie as being too silly after viewing the trailers but as my mantra goes; let’s watch the final product before coming to a true opinion. ‘Kong: Skull Island’ satisfied my expectations and squashed some of my early negative speculations. Kong turned out to be quite the entertaining bit that I enjoyed a lot. Action-packed and beautifully done are the two elements that stick out for me. Next to its Monsterverse counter-part ‘Godzilla’, Kong is featured a lot in this film and dukes it out constantly with foes. Which was the source of major backlash that ‘Godzilla’ faced. From the very get go, ‘Kong: Skull Island’ comes out swinging for the fences with action. So if you are going into this film desiring battles and action-packed scenes, you have your film here… To my other point, there were a multitude of scenes that left me saying “wow” in my seat from how brilliant and epic this film looked. There is something about a hell-torn environment in flames with a menacing King Kong standing in the distance that just puts chills into my body. Epic is the only way to describe these scenes… Beyond these two huge points that make this film for me and a variety of other reasoning, there are plenty bits that I could nit-pick at but they held no weight in my overall enjoyment of this film as it was incredibly entertaining. I am able to put criticisms aside when it comes to an entertainment factor unlike many of my reviewer colleagues. Overall, a fantastic and entertaining film that instills crazed excitement for the coming Monsterverse. It is fun, action-packed, and comedic to its own right. Check it out and enjoy the constant Kong action that is ‘Kong: Skull Island’. Posted in 2017 Movies, Movie Review.Tagged Brie Larson, Corey Hawkins, John C. Reilly, John Goodman, Jordan Vogt-Roberts, King Kong, Kong Skull Island, Samuel L. Jackson, Tom Hiddleston.